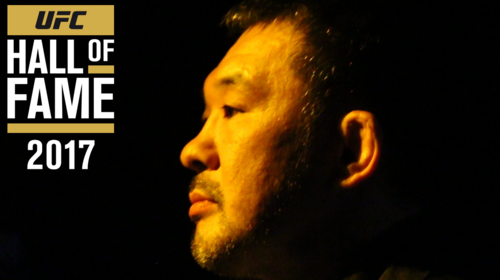 UFC Hall of Fame: Kazushi Sakuraba Jun 3, 2017 (4:24) UFC and PRIDE FC legend Kazushi Sakuraba will take his place in the UFC Hall of Fame. Relive the Japanese Pioneer's greatest Fights now on UFC FIGHT PASS! 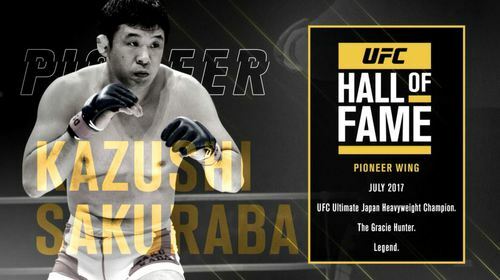 2017 UFC Hall of Fame: Backstage with Kazushi Sakuraba Jul 10, 2017 (5:01) Go backstage with Kazushi Sakuraba at the 2017 UFC Hall of Fame Induction Ceremony featuring Urijah Faber, Kazushi Sakuraba, Maurice Smith and Joe Silva. Kazushi Sakuraba vs. Ikuhisa Minowa PRIDE: Shockwave 2005 Dec 31, 2005 (14:50) In his final PRIDE performance, fan-favorite catch-wrestler Kazushi Sakuraba was the epitome of an MMA superstar in Japan and readied to make his 27th PRIDE appearance, where he had gone 17-8-1, against fellow fan-favorite catch-wrestler Ikuhisa Minowa. Kazushi Sakuraba vs. Ken Shamrock PRIDE 30: Fully Loaded Oct 23, 2005 (9:44) In his first PRIDE bout in over 3 years, former UFC superfight champion Ken Shamrock entered the ring to face a fellow pro wrestler & Japanese MMA veteran in Kazushi Sakuraba, who had a 17–9–1, 1NC with 14 wins by finish. 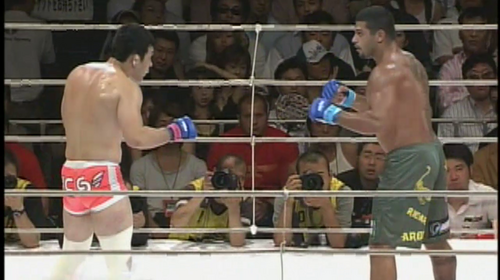 Ricardo Arona vs Kazushi Sakuraba PRIDE: Critical Countdown 2005 Jun 26, 2005 (22:37) In the quarterfinals of the 2005 PRIDE Middleweight Grand Prix, Brazilian Top Team’s BJJ blackbelt Ricardo Arona, sporting a 10-2 MMA record and a clear size advantage, took on fan-favorite catch-wrestler Kazushi Sakuraba, who had a 17–8–1, 1NC pro record. Kazushi Sakuraba vs. Dong Sik Yoon PRIDE: Total Elimination 2005 Apr 23, 2005 (3:39) It was a submission grappling fantasy match-up, as Japanese MMA megastar & catch-wrestler Kazushi Sakuraba entered the PRIDE 2005 Middleweight Grand Prix opening round to scrap with highly-accomplished judo blackbelt Dong-Sik Yoon, who was making his pro MMA debut. 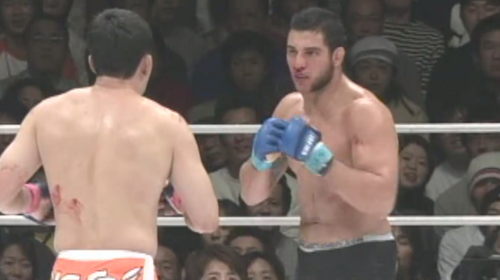 Kazushi Sakuraba vs Antonio Schembri PRIDE: Critical Countdown 2004 Jun 20, 2004 (34:08) In a rematch from their bout a year earlier, Chute Boxe’s BJJ blackbelt Antonio Schembri aimed to prove his upset win was no fluke as he entered the PRIDE ring to face fan-favorite catch-wrestler Kazushi Sakuraba, who owned 11 of his 15 wins by submission. 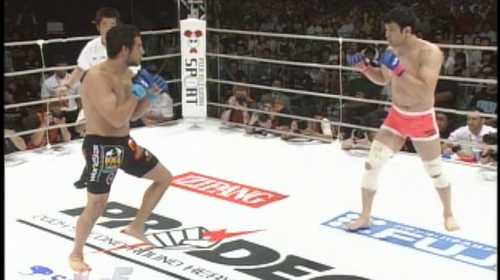 Antonio Rogerio Nogueira vs Kazushi Sakuraba PRIDE: Shockwave 2003 Dec 31, 2004 (31:24) At 3-0 in the PRIDE ring, BJJ blackbelt Antonio Rogerio Nogueira was beginning to rise through the MMA ranks like his famous twin brother did and readied for a rumble with catch-wrestler Kazushi Sakuraba, who had just secured his 11th submission win. Kazushi Sakuraba vs. Kevin Randleman PRIDE: Final Conflict 2003 Nov 9, 2003 (29:13) Both aiming to rebound from KO/TKO losses in their previous PRIDE bouts, two very different grapplers collided as the all-powerful former 2x NCAA D1 National Champion wrestler Kevin Randleman took on the submission savvy catch-wrestler Kazushi Sakuraba. Wanderlei Silva vs. Kazushi Sakuraba PRIDE: Total Elimination 2003 Sep 10, 2003 (16:26) For the third & final time, fan-favorite catch-wrestler Kazushi Sakuraba entered the PRIDE 2003 Middleweight GP with his sights set on his first win over the Muay Thai striking menace & PRIDE middleweight champion “The Axe-Murderer” Wanderlei Silva. Antonio Schembri vs. Kazushi Sakuraba PRIDE 25: Body Blow Mar 16, 2003 (15:40) Earning two wins in PRIDE’s ring in his first two MMA fights, Chute Boxe’s BJJ blackbelt Antonio Schembri was ready to take a step-up in competition against catch-wrestler Kazushi Sakuraba, who owned a 14-5-1, 1NC pro record filled with submission wins. Kazushi Sakuraba vs. Gilles Arsene PRIDE 23: Championship Chaos 2 Nov 24, 2002 (25:08) At times, this bout was more comedy than action, but it was still very entertaining as fan-favorite catch-wrestler Kazushi Sakuraba entered the PRIDE ring for his 18th appearance against the fairly untested French grappler Gilles Arsene, who was 1-0 in MMA. Mirko Cro Cop vs. Kazushi Sakuraba PRIDE: Shockwave 2002 Sep 28, 2002 (15:23) No one could ever question the toughness of “Saku”! 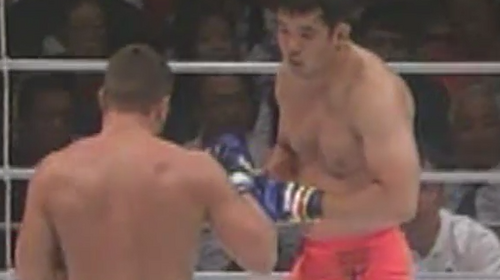 Giving up size & strength, beloved Japanese catch-wrestler Kazushi Sakuraba, with his 13-4-1, 1NC record, took to the PRIDE ring to scrap with the undefeated Croatian kickboxer Mirko “Cro Cop” Filipovic. Wanderlei Silva vs. Kazushi Sakuraba PRIDE 17: Championship Chaos Nov 3, 2001 (21:08) Unbeaten in eight bouts in the PRIDE ring, Wanderlei “The Axe-Murderer” Silva faced off against the beloved Kazushi Sakuraba, a crafty submission wrestler who had just defeated “Rampage”. Kazushi Sakuraba vs. Rampage Jackson PRIDE 15: Raging Rumble Jul 29, 2001 (10:33) Making his PRIDE debut, powerhouse Quinton “Rampage” Jackson was a 10-1 pro riding an 8 fight win streak into a memorable clash with the dangerous submission game of catch-wrestler Kazushi Sakuraba, who owned a 13-3-1, 1NC pro record. 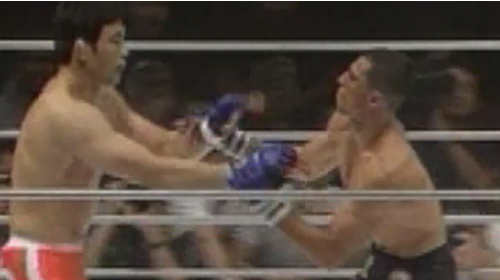 Wanderlei Silva vs. Kazushi Sakuraba PRIDE 13: Collision Course Mar 25, 2001 (12:21) Riding a three fight win streak, with two of those wins coming over members of MMA’s first family, catch-wrestler Kazushi “The Gracie Hunter” Sakuraba entered the PRIDE ring to face Brazilian knockout artist Wanderlei “The Axe-Murderer” Silva, who had won 10 of his 13 wins by KO/TKO. Kazushi Sakuraba vs. Ryan Gracie PRIDE 12: Cold Fury Dec 9, 2000 (15:55) Following back-to-back submission wins, fan-favorite catch-wrestler Kazushi “The Gracie Hunter” Sakuraba returned to his pastime of fighting members of MMA’s first family as he took on BJJ blackbelt Ryan Gracie, who had scored a quick KO in his PRIDE debut. Kazushi Sakuraba vs. Shannon Ritch PRIDE 11: Battle of the Rising Sun Mar 20, 2014 (3:52) Following a historic arm-breaking win in his last appearance, fan-favorite catch-wrestler Kazushi Sakuraba, with his 10-2-1, 1NC pro record, took to the PRIDE ring for the 12th time to face 20 fight MMA veteran Shannon “The Cannon” Ritch. Kazushi Sakuraba vs. Renzo Gracie PRIDE 10: Return of the Warriors Aug 27, 2000 (31:46) Aiming to get some revenge on the man they call “The Gracie Hunter”, BJJ blackbelt Renzo Gracie, with his 9-1-1, 1NC pro record, took to the PRIDE ring to face catch-wrestler Kazushi Sakuraba, who had scored stoppage wins over two Gracies in the past year. Igor Vovchanchyn vs. Kazushi Sakuraba PRIDE: GP 2000 Finals May 1, 2000 (18:51) Following his legendary 90 minute match with Royce Gracie earlier in the night, catch-wrestler Kazushi Sakuraba took to the ring for this semifinals bout against seemingly unbeatable kickboxer Igor “Ice Cold” Vovchanchyn, who won by TKO in the quarters. 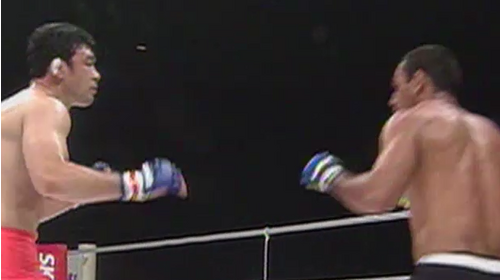 Kazushi Sakuraba vs. Royce Gracie PRIDE: GP 2000 Finals May 1, 2000 (1:53:50) This is the definition of epic! 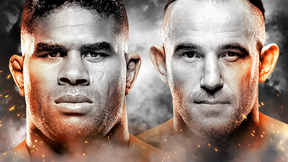 In the quarterfinals, 3x UFC tournament winner Royce Gracie requested special rules - no time limit & no referee stoppage - as he aimed to exact revenge on catch-wrestler Kazushi Sakuraba, who bested his brother, Royler. Kazushi Sakuraba vs. 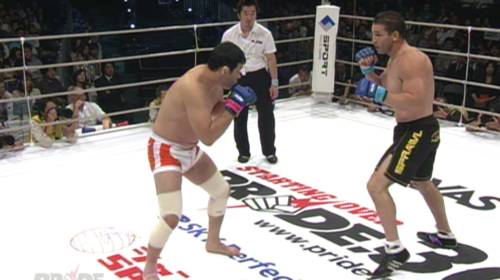 Guy Mezger PRIDE: GP 2000 Opening Round Jan 30, 2000 (23:31) Per usual, catch-wrestler Kazushi Sakuraba was giving up a lot of size to his PRIDE Grand Prix 2000 Opening Round opponent - Lion’s Den striker Guy Mezger. 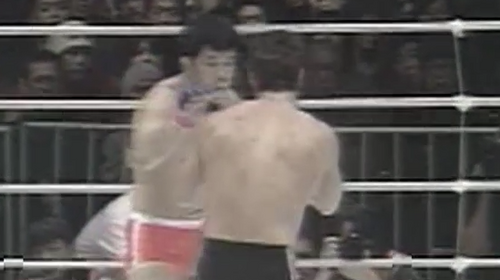 While Sakuraba was coming off a historic sub win, Mezger aimed for redemption after two losses. Kazushi Sakuraba vs. Royler Gracie PRIDE 8 Nov 21, 1999 (33:44) Without giving away the ending, this bout was a watershed moment in MMA history. In one corner, catch-wrestler Kazushi Sakuraba, who was on a six fight unbeaten tear in PRIDE, faced revered BJJ blackbelt Royler Gracie, who was an undefeated 3-0 in MMA. Kazushi Sakuraba vs. Anthony Macias PRIDE 7 Sep 12, 1999 (18:05) Catch-wrestler Kazushi Sakuraba was, officially, on a hot streak with five wins, four submissions, and 0 losses in PRIDE or the UFC. Up next, “Saku” took to the ring to take on the aggressive attacker Anthony “Mad Dog” Macias, who had a 15-5 pro record. Kazushi Sakuraba vs. Ebenezer Fontes Braga PRIDE 6 Jul 4, 1999 (14:50) After an impressive win over “The Phenom”, catch-wrestler Kazushi Sakuraba was on a five fight unbeaten streak heading into another high-profile bout with another vaunted submission artist in BJJ blackbelt Ebenezer Fontes Braga, who owned a 10-3-1 MMA record. Kazushi Sakuraba vs. Allan Goes PRIDE 4 Oct 11, 1998 (35:07) Riding back-to-back submission wins in PRIDE, professional wrestler Kazushi Sakuraba was proving to be as dangerous as he was entertaining and headed into a grappling-heavy bout with high-ranking BJJ blackbelt Allan Goes, who had a 3-1-1 pro record. Kazushi Sakuraba vs. Vernon White Pride 2 Mar 15, 1998 (30:49) Japanese professional wrestler Kazushi Sakuraba ,who had just won the UFC Ultimate Japan tournament, was making his PRIDE FC debut against the Lion’s Den’s stand-up specialist Vernon “Tiger” White, who came into the bout with 30 fights under his belt. Kazushi Sakuraba vs. Marcus Silveira UFC Japan, 1997 Dec 21, 1997 (6:40) In the second heavyweight tournament semifinals match, MMA and Japanese professional wrestling legend Kazushi Sakuraba made his Octagon debut in a huge mismatch in size against the 240+ pounds of Brazilian jiu-jitsu blackbelt Marcus Silveira.